NB The graphic shows where teams will be relegated to initially - Level Transfer could change this! Promotion will take longer to be decided! Its the relegations from N2 that have a big (biggest?) influence on N3 leagues. I would reckon that N3N is going to get three relegations (Westoe, Stockport, Huddersfield) down from N2N. Err. Billingham is not exactly very close to the midlands. ......but then London Irish Wild Geese from Sunbury are not really in the South West! Barking only have 5 to play and I think they are now relegated. Indeed, 5 to play and guaranteed bottom spot unless one of their rivals gets hit with a points deduction. People tend to forget that N2S only has 15 sides thanks to Rugby's late departure, so as playing with yourself is frowned upon, it's only 28 games this season. I agree that it's very likely and that, being only the second year, they have no option if they are the 'chosen', what's more concerning is the knock on effect, as more 'North' club(s) may have to head to the Midlands. I think Sandbach have enjoyed their sojourn in flat capless land, mind. 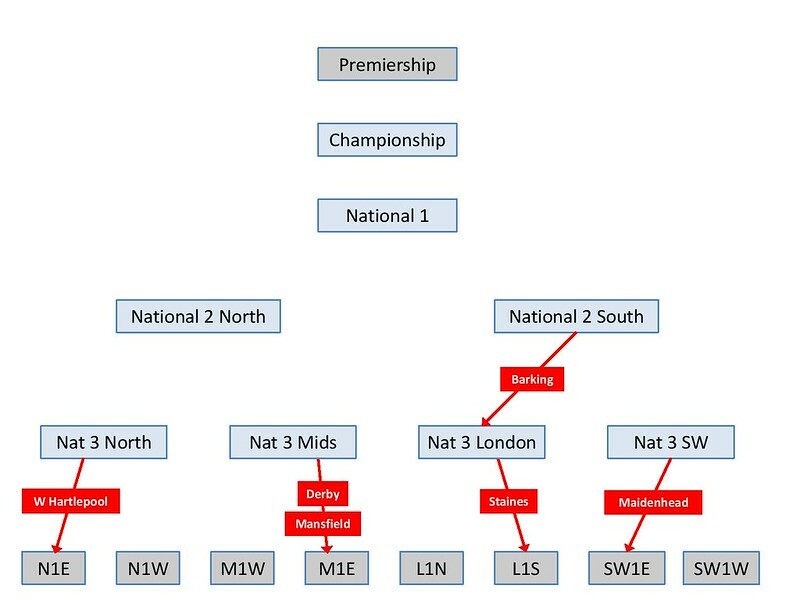 Four of the five candidates for relegation from N1 are North clubs, likely two will join Cambridge while the three promoted from level 5 may result in a level transfer South, depending upon Ionians efficiency. It's possible there'll be room in N3M for one level transfer as the top two have significantly better records than their N3N rivals leading to home advantage in the playoff, not a gimme though. The consequence may be two double level transfers (see Sandbach & Malvern this season) with two North clubs coming to the Midlands and two Midlands clubs going who knows where! More interesting than some games this season! Yes, Sandbach will be "put back" in National 3 North before the LT merry-go-round starts, but it seems pretty certain that they will be first asked to move south unless there are any volunteers. I thought you might have meant Sandal as you overlooked them in favour of clubs with a much greater latitude! That raises an interesting point - as I had to keep explaining last year, the graphic shows what happens before Level Transfer takes place, i.e. all teams are sent into the right league based on their CB and adjustments are then made only if the numbers don't balance. However, the Midlands Division did away with CB-based leagues (e.g. Notts/Lincs/Derbys 1) some time ago in favour of the more prosaic "Midlands 2 West (North)" et al. 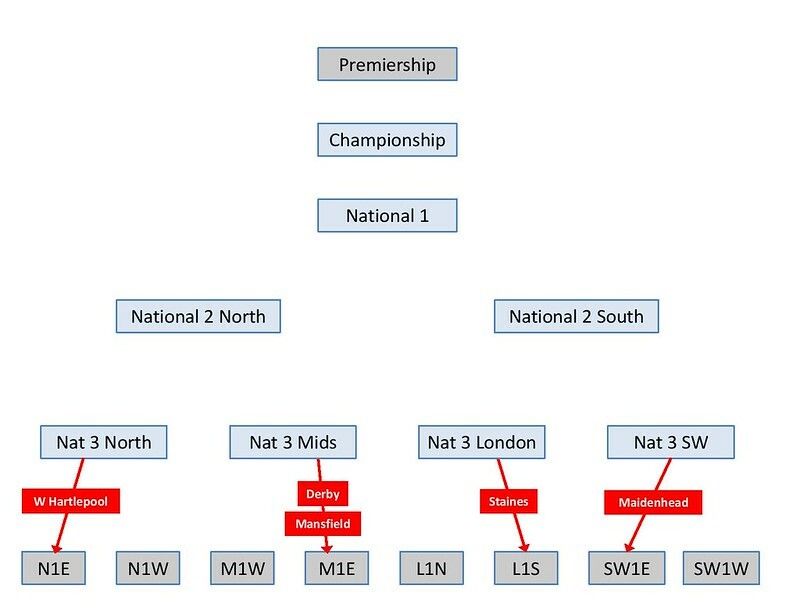 Does this mean that teams don't actually get relegated to Midlands 1 West or East depending on their CB (in the way that Yorkshire clubs go into North 1 East and Cheshire sides into North 1 West), but simply to Midlands 1, with the 28 sides getting neatly divided on travelling distance? Perhaps then you should show the levelled clubs also transferring back 'home'? Sandbach to N3N, Malvern to Midlands ? Others? Those all ought to be known now. That might be a more accurate view of the starting points? Always in an interesting thread at the business end of the year. Well done CharlieP for putting it together. Just to add another thought to the mix, albeit this will be decided long after the season has finished. With Rugby Lions applying to return to the RFU league structure, at what level would you expect them to be re-instated? Level 6/7 maybe? Or at the bottom of the pile? The latter I would not like to see tbh.. It will be at the bottom of the pile...if at all. Actually, I just didn't look deep enough - my my reckoning Beverley are already champions of North 1 East, with a 21 point lead over Sheffield and only four games to play. Nor close enough - third-placed Wheatley Hills have one more game in hand, so Beverley still need two more points to seal the deal.